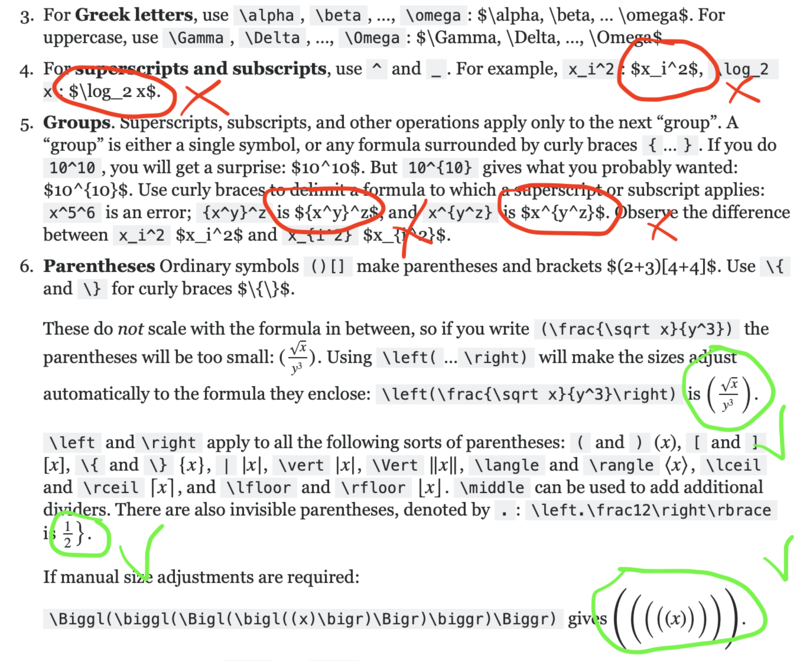 I'm seeing something odd with the inline MathJax rendering on the MathJax basic tutorial. There are 15 items in a numbered list in the tutorial. For items 1 to 5 (and also the first part of item 6) the inline mode MathJax rendering does not work. I tried Safari, Firefox and Chrome on macOS Mojave. From somewhere in item 6 downward, the inline mode MathJax rendering works fine. Display mode rendering works fine throughout the tutorial. Can someone confirm this or is it just me? Does someone have a clue what's going on? Sorry about that, that's my bad. The markup Davide Cervone is referring to is what tells our diff engine to treat formulas as atomic units and allows us to present rendered formulas in the post revision history. We insert it into the post's HTML before saving a revision. Unfortunately, there was a bug with the parser in posts that had code blocks that also included MathJax. The bug has been fixed and I rebaked the tutorial post to correct its stored markup. If any other posts are affected, they can be fixed by editing. Or alternatively, drop a link in the comments on this answer and I'll fix them up. which shows that the closing dollar sign is inside an element <span class="math-container">. MathJax only processes math when the entire math expression (including its delimiters) are in the same text run, so that extra <span> is causing MathJax to not recognize the expression. That is why you are not seeing typeset math. These spans are not in the original text, and don't show up in the editing preview, so I assume they are something inserted when the post/answer is pre-processed on the server after it is edited and is being put in its final form. 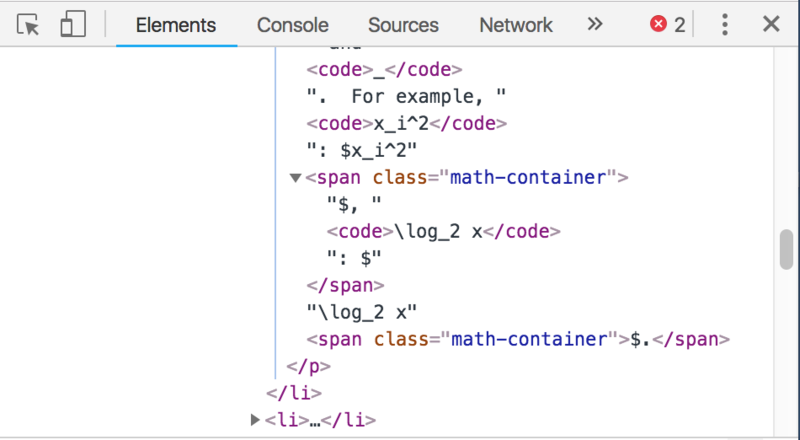 It looks like someone has been trying to insert containers for the math, but has gotten the delimiter balancing wrong. It is not part of MathJax. It may be that StackExchange has rolled out a new version of its software, and that it is a new bug introduced by that. Not the answer you're looking for? Browse other questions tagged support bug status-completed mathjax .